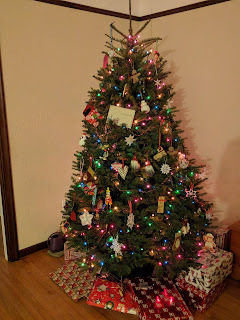 We had a lovely Christmas this year. 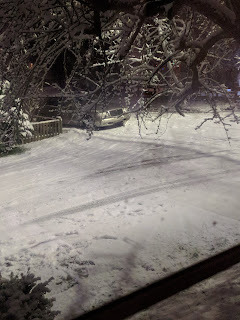 It started snowing on Christmas Eve and by Christmas morning we probably had about 3 inches - practically a blizzard for the PNW. 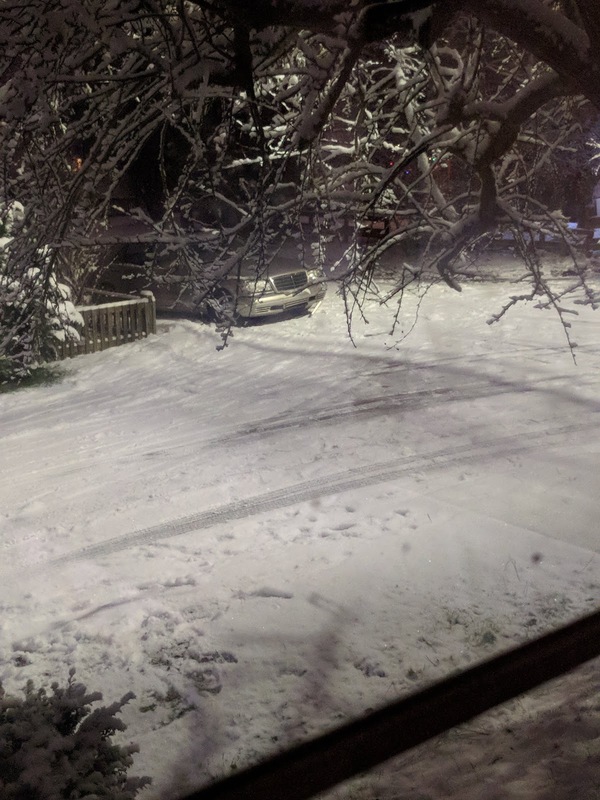 In fact, the car you see in the picture below got stuck trying to turn at our intersection. 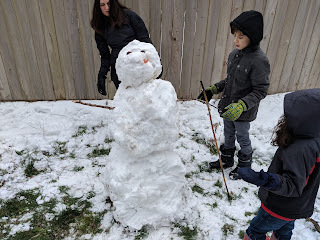 The kids played in it on the deck while waiting for Christmas Eve dinner (Coconut chicken fingers over rice, broccoli, delicata squash, and gingerbread steamers). Mal joined us in watching our traditional A Christmas Carol (George C. Scott version) for the first time ever. Gareth is turning into quite the night owl, so Ryan and I had to hang out and watch something while waiting for him to fall asleep - kind of annoying when you have everything ready, but are forced to stay up late waiting for the kids to fall asleep. The benefit to having more night owl kids is that they sleep in in the morning. Here they are discovering their stockings/presents under the tree. Then Mal checked out the snow outside. 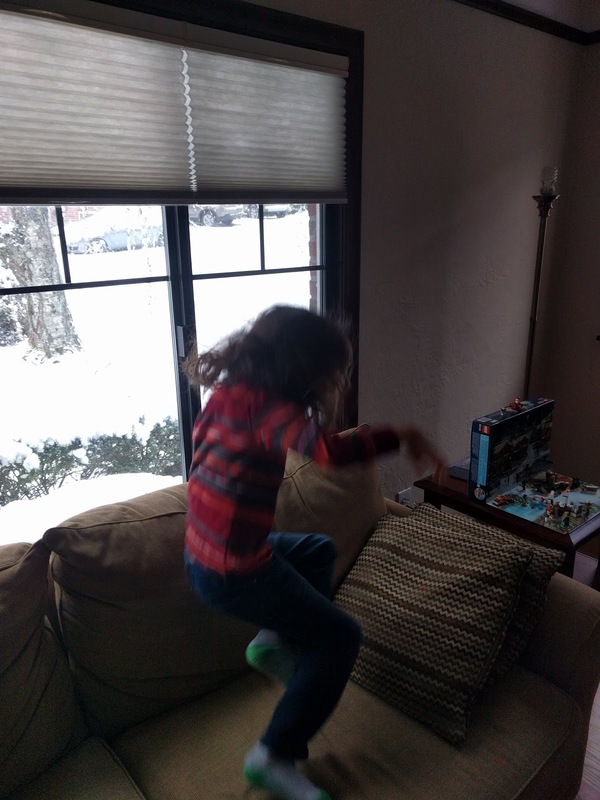 I caught an action shot of his expression of excitement about it. 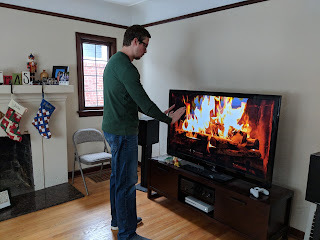 Ryan warmed his hands by the fire. Gareth requested Christmas sweaters for everyone this year, and Santa obliged. 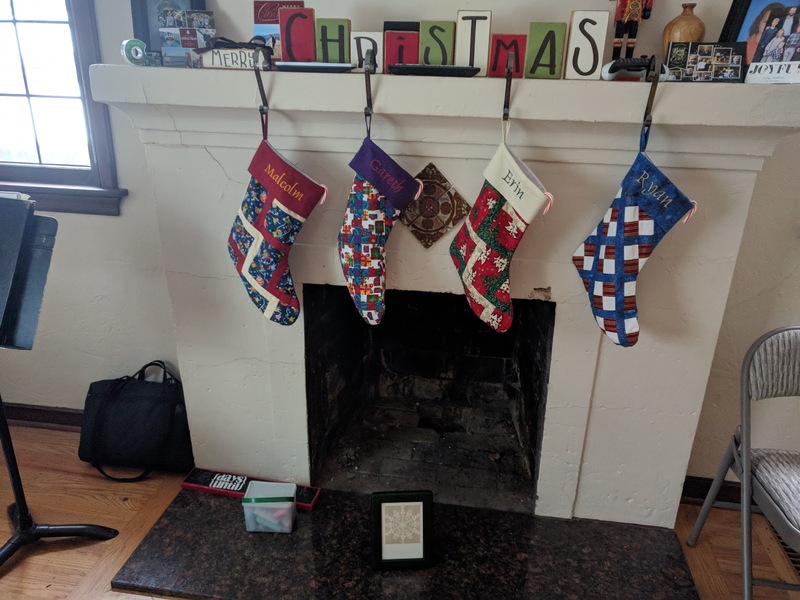 The kids opened those first. Mal was disappointed at first, saying, "Aw, that's not what I asked for for Christmas!" 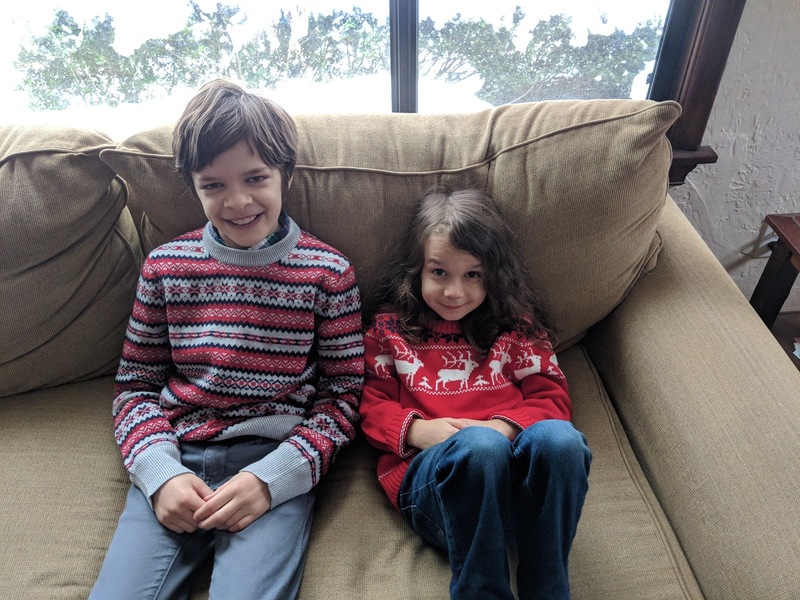 But he's turned out to love his sweater, wearing it pretty much every day since. 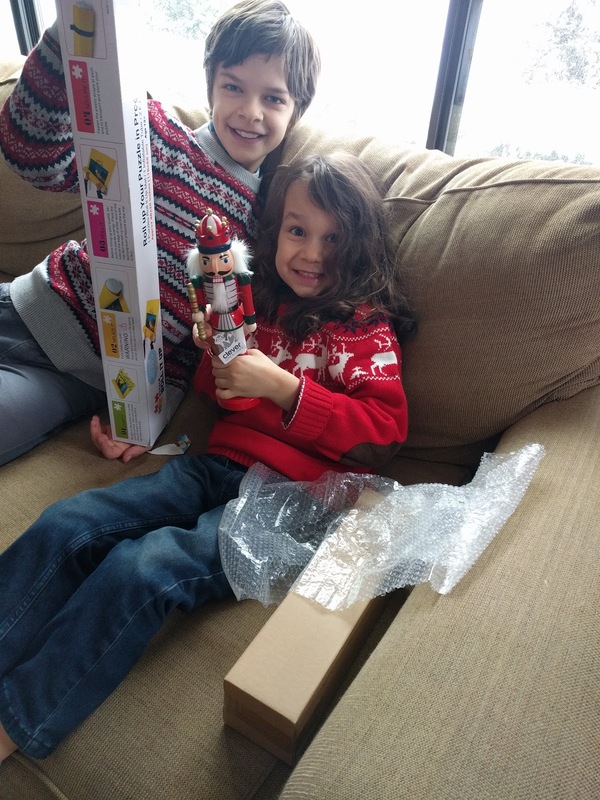 He was very excited when he opened his first package from Gram, who gave him the nutcracker he'd asked for, "This is what I wanted for Christmas!!". 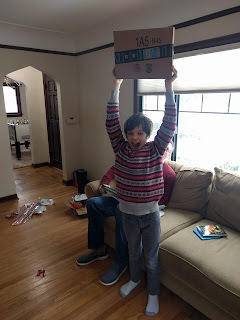 Lots of gifts were unwrapped to reveal boxes this year, so the kids started acting overly excited for every single box. "Yes!! 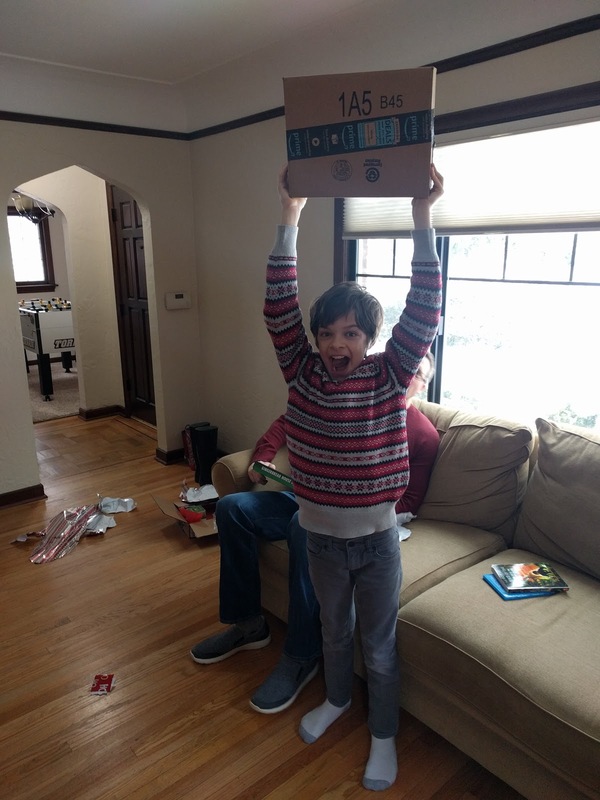 I got a box!!" 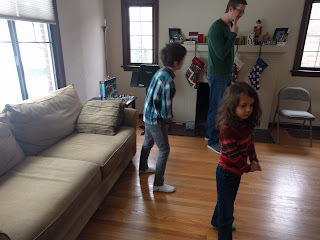 After we were finished opening presents, the kids went outside to play in the snow. After a bit, Gareth came in requesting help to get the snowman's midsection onto the base, so out I went. Mal was grumpy in this picture because Gareth had put in the pinecone eyes and hadn't left one for Mal to do. We soon fixed that by having Mal put in the buttons. 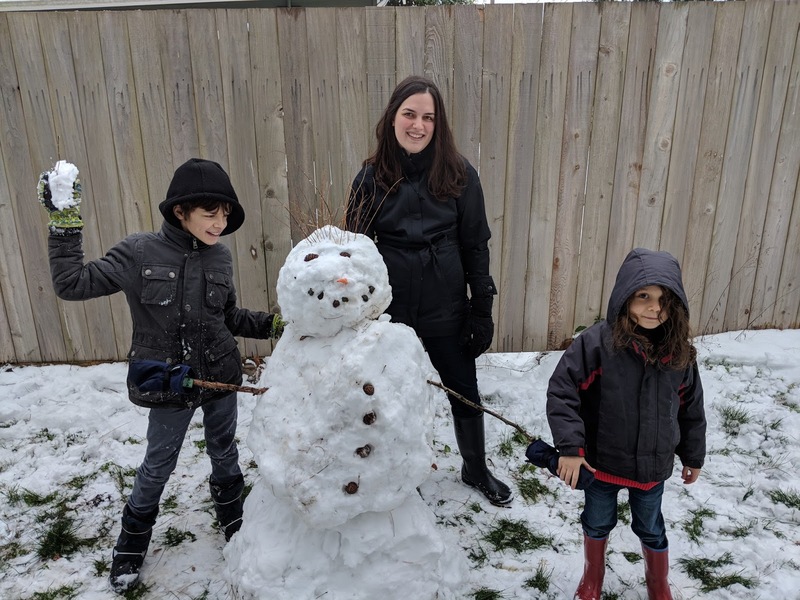 Finished snowman and a happier Mal! 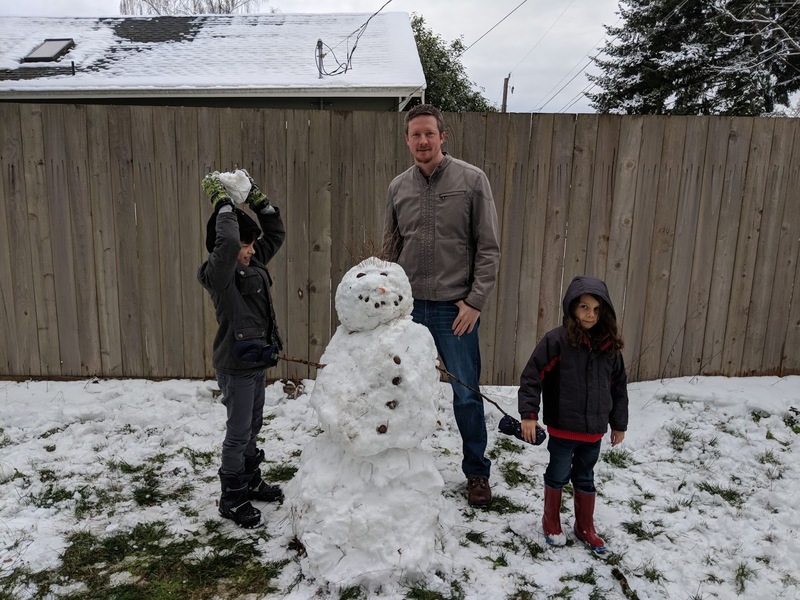 Then we had a brief snowball fight. 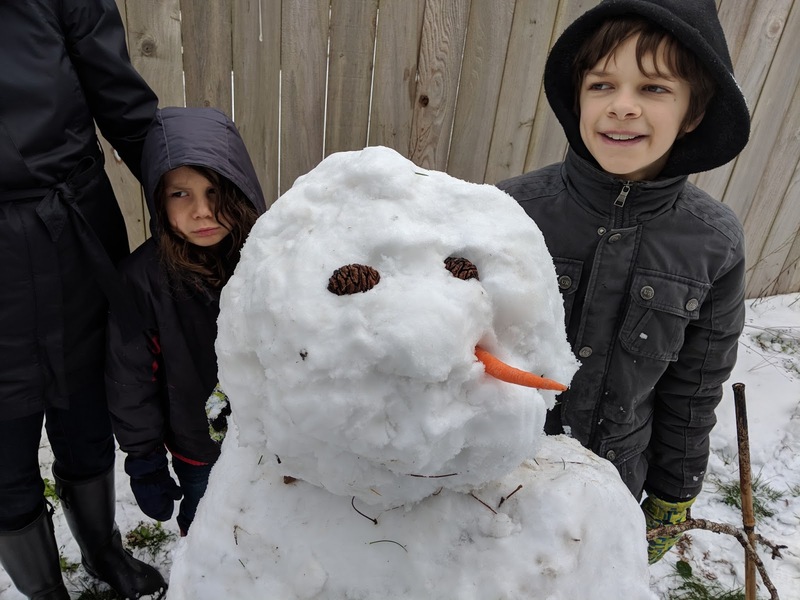 Mal had donated his mittens to the snowman and realized after a bit that this meant cold hands. 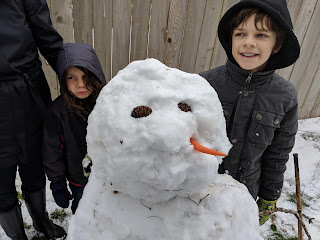 He wanted the snowman to keep the mittens, though, so decided he was ready to head in. The snow turned to ice by the next morning, but by today was completely melted, except for a couple snowman remnants. Looks like fun was had by all! Merry Christmas!